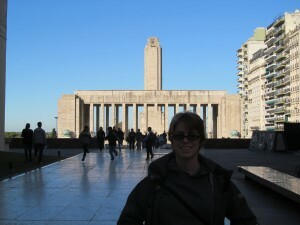 Well, the first week in Argentina is complete and I made it through! Quite honestly I spent most of the time exhausted from jet lag and classes but over all it went pretty well. Classes aren’t difficult, but long. The hardest class I have is Spanish grammar level 2 and that is only difficult because she explains it in Spanish so we don’t know what’s happening. It’s getting better, but still. My first day in class was one of the worst things I had ever faced in my life. I woke up with a mild fever, more like a summer cold, and a pounding headache before walking to class. At first I thought it was just dehydration, but after chugging bottles of water at the university and it not getting better, I realized what it was. The smoke from Rosario (smog and cigarettes) was causing the headache. Once I realized what caused it, I could live with it. For our History of Soccer class we went to a sports bar to watch the game on the tv there. 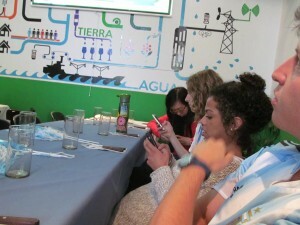 Argentina was playing Nigeria and it was a huge deal. Kids were let out from school early to get there to watch the game. People were painted white and blue, flags were everywhere, and you could feel the excitement in the air. Even though I felt like I was going to puke, when Messi scored the first goal I was out of my seat screaming with everyone else in the bar. It was chaos. And when Argentina won, the owner set off fireworks. Watching Argentina win while checking how the USA is doing during the World Cup. After that, a couple of the students and I took a walk down Cordoba street before heading back to the university for evening class. The next day we had class, and out grammar teacher took us on a two hour walk where we be-friended two stray dogs who joined our pack of kids. Then, the mature adults we are, we decided to play in the park with the dogs before heading back for soccer class. This time we had a lecture then watched the end of the Germany/USA game. We were going nuts, about 20 Americans screaming at the screen while these poor Argentines were trying to eat lunch. Today we had a fun excursion after class. We were given a walking tour of Rosario, told the history around Cordoba street, and showed where the pedestrian walking streets were. Not only that, but we also walked to the National Flag Monument (Monumento de Banderas) where the Argentine flag was originally created. We passed by a cathedral, which I am going to return to take pictures of soon, and walked through the Monument which leads to the river. It was gorgeous, a massive project. To give a rough estimate, it was about the size of the Reflecting Pool and Lincoln Memorial in Washington D.C.
Me at the National Flag Monument in Rosario. I went home after that because the day was over, and found out that we were having a fiesta tonight. 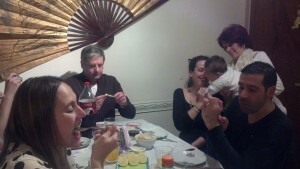 It turns out today is my host mother’s birthday and her family came over. I met her son, daughter-in-law, brother, niece, nephew, and nephew’s girlfriend. Her son also brought his daughter, so it was the entire family there. There was a ridiculous amount of food and it was all amazing. We had empenadas, tostitos, and pizza which is apparently a treat in Argentina. After we had chocolate tarts with champagne and they kept trying to give me whiskey. During the entire fiesta, the nephew kept asking me questions in English which I had to respond to in Spanish. This is what the night resulted in, he has decided when he and his girlfriend get married they will honeymoon in San Francisco. They announced they would stay at my house for five weeks because I was staying here for five weeks. I told them they needed to talk to my mother, because it wasn’t my house. My host mother chimed in saying my father wouldn’t like me living with strange Argentine boys even if they were married. The nephew’s plan? Show up to my house in drag and pretend to be a girl. I’m pretty sure this entire thing was a joke, but don’t know enough Spanish to be entirely sure. The highlight of the night was when I was trying to explain what a forest fire was, and all they got was forest. Next thing I know, the entire table is yelling “Run Forest run!” while I try to figure out what just happened. My host mother (Monica’s) birthday party. This entry was posted in Argentina and tagged Argentina, Jennifer Hight by Jennifer Hight. Bookmark the permalink.